Pro-Assad hacker group, the Syrian Electronic Army, breaks into the Associated Press Twitter account and tweets about a bomb detonating in the White House, causing a stock market free fall to the tune of $136 billion. Internet videos emerge depicting a Syrian rebel commander eating the lung of a dead government soldier. The cannibalism stunt is used by anti-war advocates around the world as justification to avoid arming the Syrian opposition. France and England believe they have proof that Assad has used chemical weapons on his own people. Israel uses this information as the catalyst to perpetrate a second bombing inside Syria, this time on Bashar Al Assad's most advanced weapons facility, which many think is used to manufacture biological weapons. Two car bombs go off across the Turkish border while the Syrian government commits massacres in Baniyas and Al Bayda, calling it an act of sectarian cleansing. The UN puts the death toll at 80,000 since the start of the conflict, as 4.5 million people are internally displaced within Syria's borders and one million refugees are displaced outside. Abu Bakr Al Baghdadi, the leader of the Islamic State of Iraq and Al Sham (ISIS), declares that Al Nusra is an extension of Al Qaeda in Iraq and Syria, which goads Ayman Al Zawahiri, the Al Qaeda number one, to intervene with a message that keeps both factions separate. In the two and a half years since the Syrian conflict began, you are amazed that you have still not killed anyone. You're quite proud of that actually. Now, you mostly spend your time photoshopping and retouching images of Al Nusra brothers carrying RPG-7s or other heavy weaponry. You run the Al Nusra Front twitter account as well as update the internet presences of the suicide martyrs. You insert the Tawhid flag on top of golden mosques and add lightening in the background and Nusra brothers riding black horses and wearing black masks in the foreground. Your propaganda campaign is becoming incredibly effective. People are making Tawhid flag-inspired birthday cakes, iPhone cases, and t-shirts. As the FSA begins to lose support, Al Qaeda factions like Al Nusra and ISIS are winning the popularity war. You begin to photoshop the Tawhid flag onto pirate ships and F1 racecars. You appropriate western memes into jihadist and Aleppan iconography and photography. On one photo of a silver Kalashnikov resting in the backseat of a technical you write, rolling with the chromey homie. 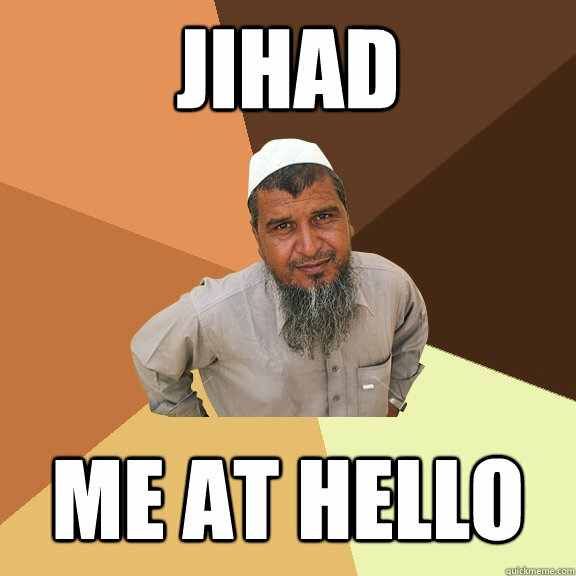 On others you put jihad me at hello and I pledged my life to jihad before it was cool. The irony that you are using creations of western culture, the thing that you are supposed to hate most, is not lost on you. As you felt before, in Aleppo you could be fighting for either side and it wouldn't matter. The images take off on Instagram encouraging others to radicalize. You try not to think about the innocents, foreign or not, that Al Nusra kidnap, torture, and extort. You know that it happens but you consider it an action of circumstance. Everything in Aleppo is so wildly dangerous and heartbreaking that it forces others into those dark places in order to survive. Hurt people hurt people is what your father Ibrahim once told you. Your father, the guy who fought for the other side at first, but left, at last, on his own. His actions were a result of circumstances, as are yours. If your family's home was not in a regime-controlled nook of Salaheddine and if your mother and two brothers were not killed by rebel fire, then maybe he would not have fought with the Ba'ath Brigades at all. Given the circumstances, however, he didn't have a choice. Death has just become so commonplace in Aleppo that inhumane treatment is a daily fact of life. You don't ask where you got the MacBook Pro you are tweeting from. You don't want to know. You don't want to know because you're afraid you may not feel guilty if you find out.